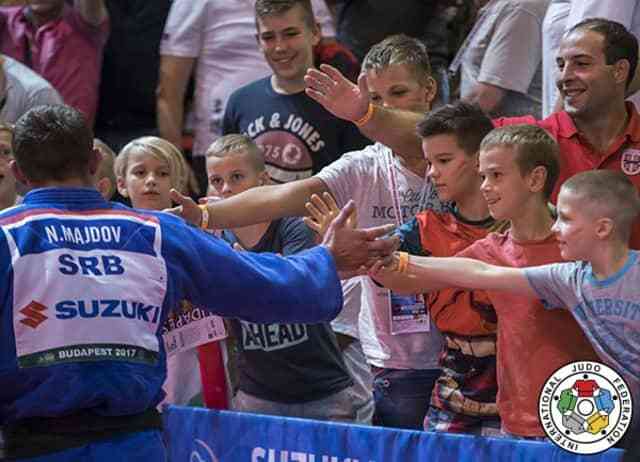 The fifth day of the 2017 Suzuki World Judo Championships produced a Serbian winner for the first time in the sport’s history while Japan returned to winning ways and Brazil tasted gold at the László Papp Budapest Sports Arena. Japan’s world number one ARAI Chizuru (JPN) won her country’s sixth world title in Budapest after the sport’s found nation had missed the medal podium entirely on Thursday. Brazilian superstar Mayra AGUIAR (BRA) became a two-time world champion with a ruthless display while Serbian youngster Nemanja MAJDOV was an unexpected winner from a team which included the world number one Aleksandar KUKOLJ who finished fifth. An IJF delegation led by IJF President Mr. Marius VIZER was officially received by the Republic of Hungary at the House of Parliament in Budapest on Thursday. After a highly-appreciated visit of the parliamentary institutions, the Hungarian Parliament building hosted an official dinner where the speaker of the National Assembly of Hungary, Mr. KOVER Laszlo, welcomed the participants: “Welcome in our magnificent parliament for that historical moment. 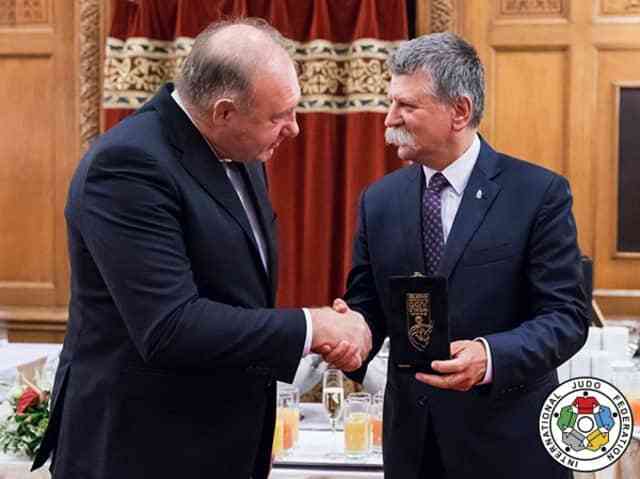 When the first world judo championships were held back in 1956, our country was struggling for its freedom and at that time no one would have dreamed of having such a big event being held in Budapest. “Today we have a burning desire to organise successful sporting events. I am involved in the political world and I can say that politicians have a lot to learn from judo people, where mutual respect and humbleness are so important. 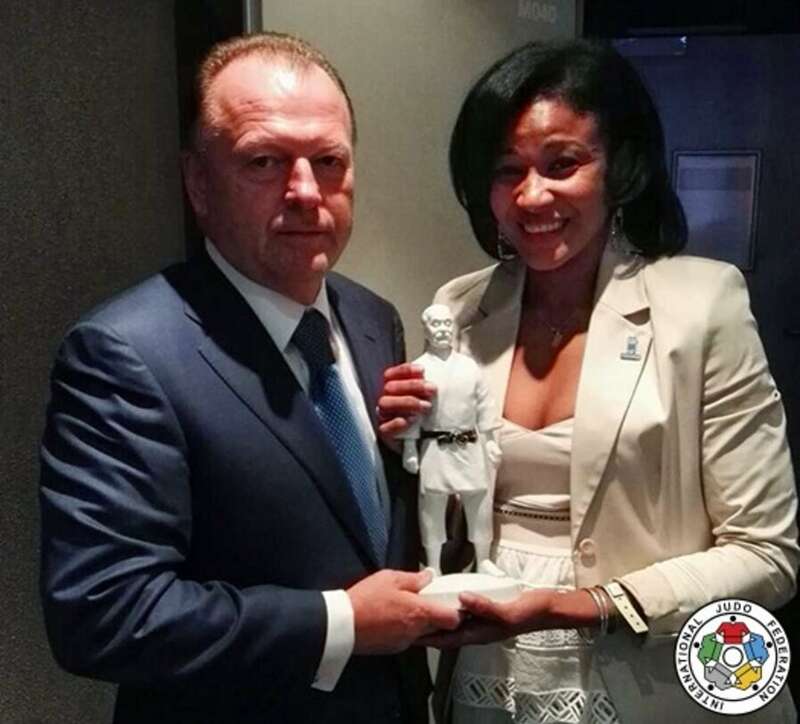 The IJF President met Beijing 2008 Olympic silver medallist and 2001 world bronze medallist Anaysi HERNANDEZ during the break and presented the long-time Cuban international with a Herend Porcelain miniature Jigoro Kano statue. HERNANDEZ, who now lives in Italy, recently completed the level one course of the IJF Academy as she looks to embark on a coaching career having retired from competitive judo in 2008. 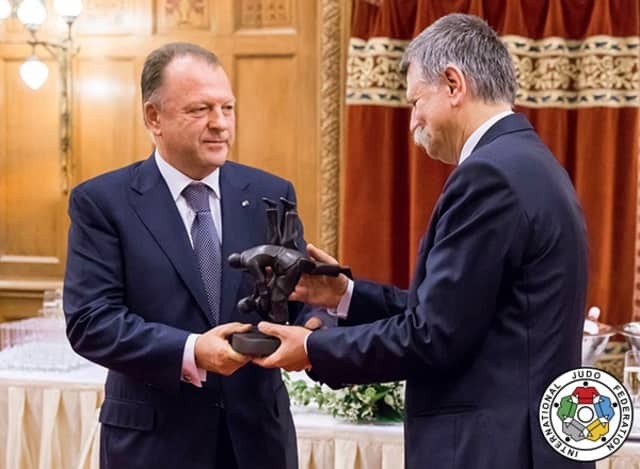 The 10-time World Cup medallist recently participated in a Twitter Q&A with the IJF President who invited the two-time Tournoi de Paris (now known as Paris Grand Slam) winner to Budapest and to the 2017 Suzuki World Judo Championships during their social media exchanges. On Friday, French heavyweight great Teddy RINER will vie for a 9th world title as he makes his long-awaited return having not competed since winning his second Olympic gold medal at Rio 2016 a year ago. RINER is unseeded and has a fresh batch of young and athletic challengers who are eager to test the Frenchman including 22-year-old European champion Guram TUSHISHVILI (GEO). Tokyo Grand Slam winner ARAI Chizuru (JPN) will bring a red backpatch home to Japan after winning her first World Championships gold medal with a professional performance that saw her overcome Olympic medallists and surprise packages. Normal business was resumed as Japan had one more gold medallist among their ranks in the form of the 23-year-old who bested former Baku Grand Slam bronze medallist Maria PEREZ (PUR) in the final. ARAI, who had won both of their previous meetings in 2013 and 2015, won one of her five contests by the maximum score and that was the gold medal contest as PEREZ had to tap out to the neatly-worked shime-waza of the Japanese. While the red backpatch joins the gold backpatch of the Rio 2016 Olympic champion TACHIMOTO Haruka in Japan, Puerto Rico had their greatest ever day on the tatami as PEREZ took Worlds silver. In the first semi-final 34-year-old former Düsseldorf Grand Prix winner Assmaa NIANG (MAR) lost out to PEREZ – who had never won an IJF event – by a waza-ari in golden score. Morocco and Puerto Rico were unfancied semi-finalists and both had hopes of winning their country’s first world judo title. It was the Pan American who prevailed in the last four stage on a memorable day for her continent. 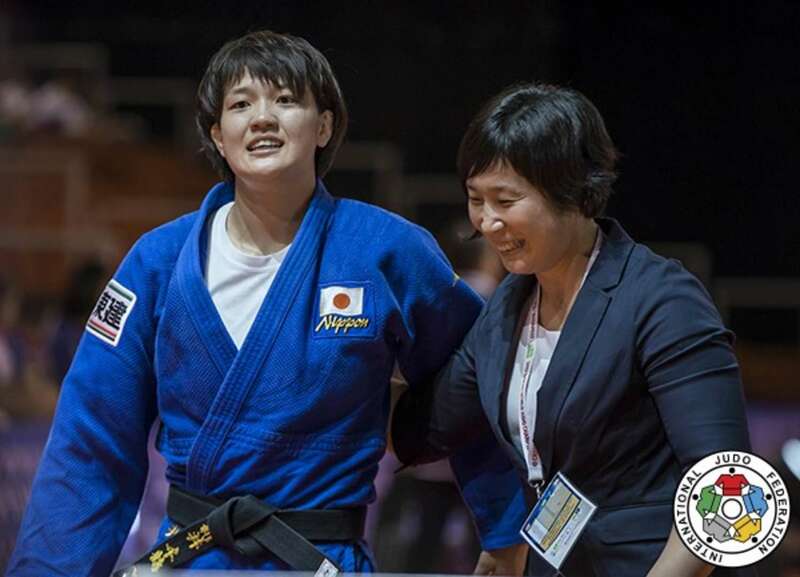 In the second semi-final Tokyo Grand Slam winner ARAI Chizuru (JPN) edged past Rio 2016 Olympic silver medallist and three-time world champion Yuri ALVEAR (COL) by a waza-ari score from a stalling uchi-mata. In the first bronze medal contest ALVEAR had too much quality and experience for European Championships bronze medallist and World Championships debutant Marie Eve GAHIE (FRA). ALVEAR, 31, who was interviewed by CNN matside with PEREZ after the awarding ceremony, came from behind to throw her 20-year-old opponent with an osoto to ko-soto combination and secured her fifth world medal by pinning down her European opponent. In the second bronze medal contest 2015 world silver medallist Maria BERNABEU (ESP) defeated NIANG to register Spain’s first medal at the 2017 Suzuki World Judo Championships. A waza-ari score from the Spaniard put her in control and NIANG could not impose herself in the most important contest of her career as the Moroccan judoka picked up three shidos to finish fifth. After leaving the tatami BERNABEU ran into the crowd and jumped onto her teammates to celebrate before leaving the field of play. The -78kg world title returned to Brazil as double Olympic bronze medallist Mayra AGUIAR (BRA) topped the World Championships medal podium for the second time. AGUIAR, who won the Worlds in 2014 in Chelyabinsk, had power, precision and poise and should not control the category on the road to the Tokyo 2020 Olympics which would be her third Games. The 26-year-old Brazilian prised the red backpatch from the defending world champion UMEKI Mami (JPN) by a waza-ari score in golden score and the Judo Sogipa star erupted with emption as the 18-strong Brazilian team created a carnival atmosphere in the stands. In the first semi-final the Netherlands’ last world champion, Marhinde VERKERK (NED), lost to UMEKI by a waza-ari score as the Japanese judoka kept on track in her bid to retain her title. In the second semi-final AGUIAR defeated three-time Grand Slam winner SATO Ruika (JPN) by a waza-ari from a drop seoi-nage. 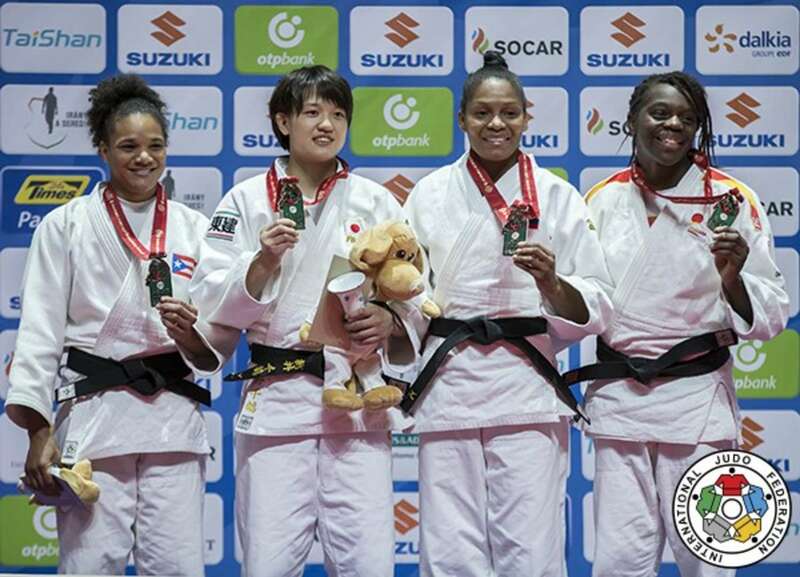 In the first bronze medal contest Cancun Grand Prix bronze medallist Kaliema ANTOMARCHI (CUB) defeated SATO by a waza-ari score as Cuba were represented on the medal podium for the first time in Budapest. ANTOMARCHI delighted her teammates in the crowd who she pointed to after being awarded the contest after a fine showing in Hungary. In the second bronze medal contest double European bronze medallist and Rio 2016 Olympian Natalie POWELL (GBR) emphatically defeated VERKERK to win a second medal for Britain this week. The 15-time Grand Prix medallist, who won Commonwealth Games gold for Wales in 2014, threw her Dutch opponent for ippon with an o-uchi-gari on the edge of the contest area to double Great Britain’s medal tally going into the final day of the individual competition on Saturday. 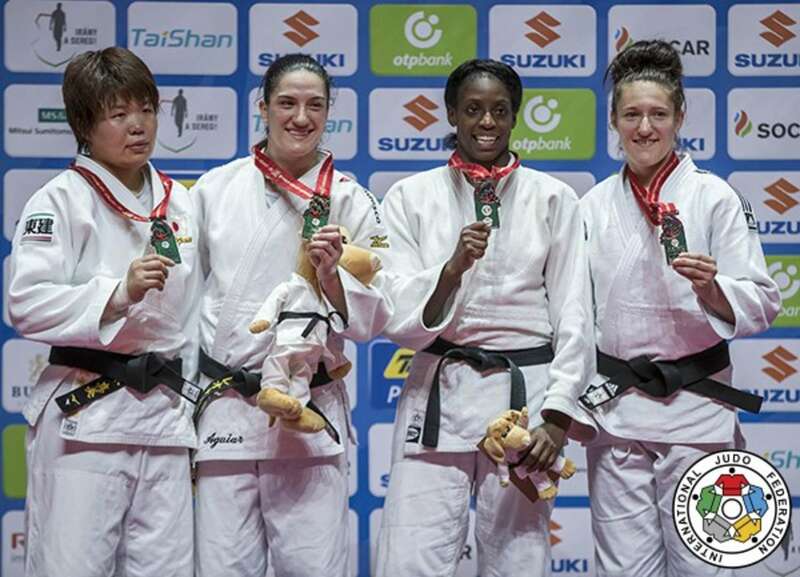 Builth Wells’ POWELL started judo aged eight at Irfon Judo Club and made good on her world number three billing by taking her first World Championships medal in the Hungarian capital. 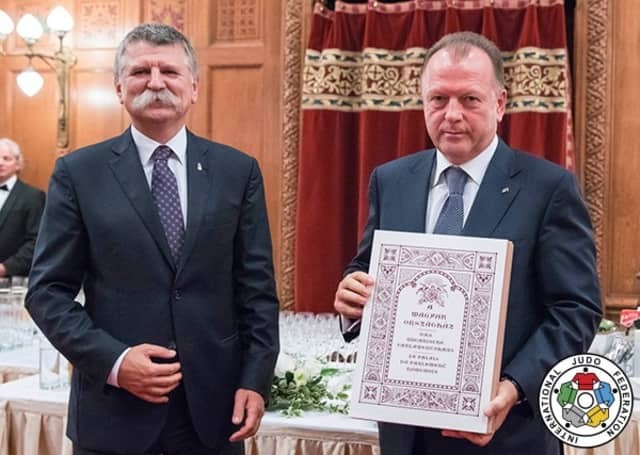 Serbia started the day with their greatest opportunity to realise their dream of crowning a world judo champion but instead of world number one Aleksandar KUKOLJ (SRB) it was a 21-year-old Worlds debutant who ruled the sport. World number 23 and Abu Dhabi Grand Slam bronze medallist Nemanja MAJDOV (SRB) was the first shock finalist in the -90kg category and was then joined by world number 14 Mihael ZGANK (SLO). Serbia had never won a world title while Slovenia had never won a world medal from their men’s team and both of those facts changed after the contest. ZGANK, 23, was penalised in golden score with a shido for ducking under the forward movement of MAJDOV which decided the fate of the world and created history for both judoka and both nations. In the first semi-final European champion KUKOLJ was surpassed by ZGANK in golden score by a waza-ari score from a ko-uchi-gari. In the second semi-final MAJDOV (SRB) bested former world silver medallist and former junior level rival TOTH Krisztian (HUN). 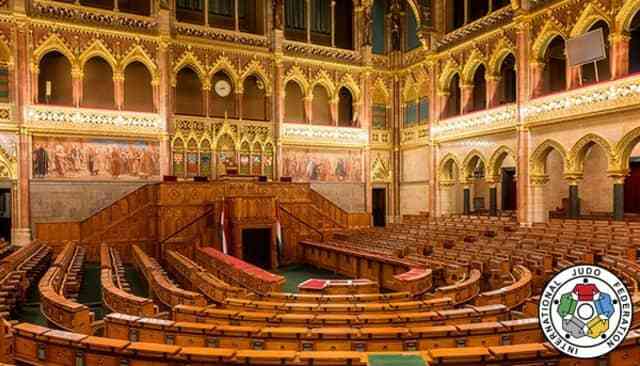 The Hungarian hope was thrown with a drop seoi-nage for a waza-ari after 90 seconds of added time and the reactions of both judoka could not have been more different. 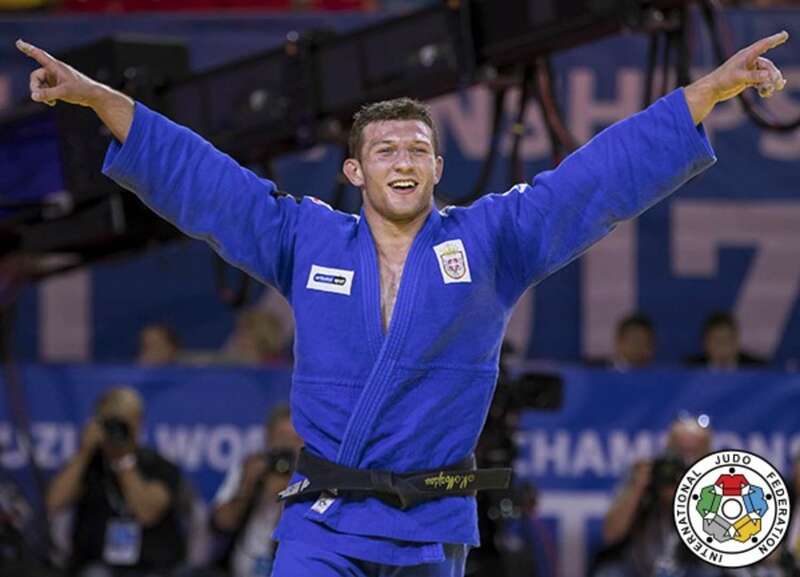 Despite his immense disappointment and in front of his family, friends and coamptriots, TOTH, showed what it means to be a judoka as he raised the hand of his conqueror and in act of incredible sportsmanship as he did when he lost the 2014 World Championships final to Ilias ILIADIS (GRE). 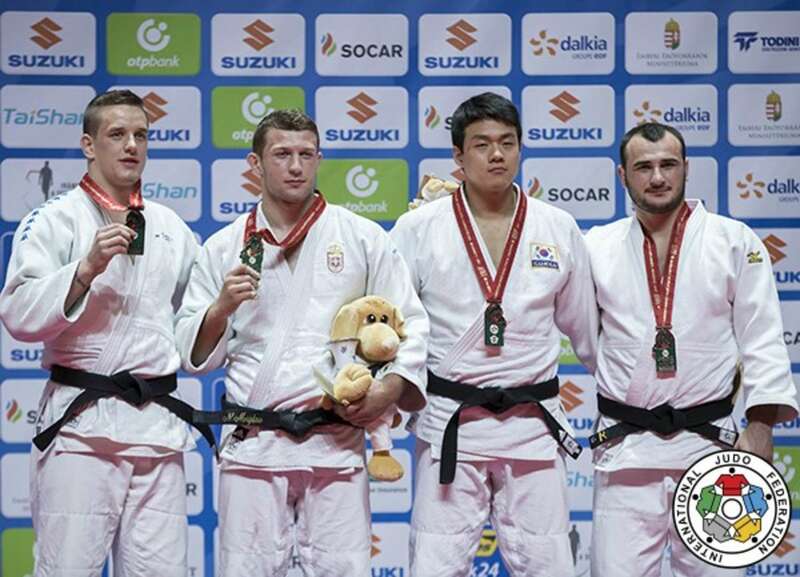 In the first bronze medal contest TOTH suffered a second agonising defeat as he fell to 2015 world champion GWAK Donghan (KOR). The South Korean judoka scored a waza-ari with 25 seconds left on the clock as he turned an uchi-mata into an o-uchi-gari to silence the home crowd. TOTH left the field of play with sadness but clapped the crowd for their support today and he will be back to compete for world medals for years to come. 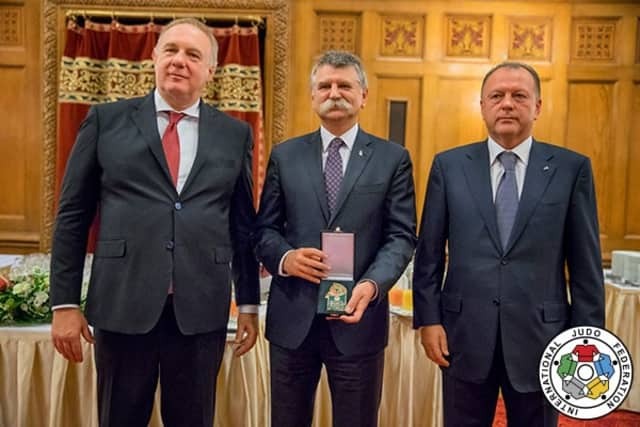 In the second bronze medal contest KUKOLJ could not salvage a place on the podium as world number 19 and two-time Grand Slam silver medallist Ushangi MARGIANI (GEO) won his first World Championships medal. Two waza-ari scores from two ura-nage gave the Georgian control of the contest and he saw off the remaining seconds to medal in Georgia’s favourite and most successful weight category.